The EMANT300 is a low-cost and compact 24 bit (DAQ) data acquisition module developed for learning purposes. It can be used readily with a desktop personal computer for data acquisition and control. When connected to a notebook, portability and/or isolation is achieved. Together with the communication capabilities inherent in the computer, it allows learners to experiment and design solutions that capture, control, compute and collaborate with the world. The high resolution 24 bit ADC, Differential Inputs & Programmable Gain Amplifier simplifies sensor connection. Learners can connect thermocouples, load cells and strain gauges directly to measure temperature, weight and strain without needing expensive and sophisticated signal conditioning. The 8 bit current output DAC allows users to measure resistance directly. Thus, resistive sensors like thermistors can be connected directly to measure temperature. The 16 but counter can be used to measure flow rate or RPM. When the counter is not used, its clock can be used for 16 bit PWM output for heating or motor control experiments. 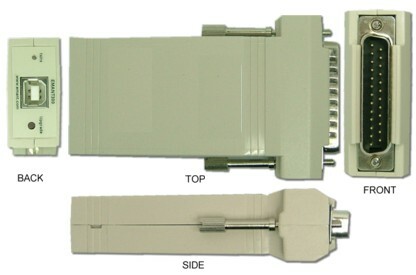 USB (can be used with USB 2.0 or USB 1.1) allows for quick and fuss free connection. 3 icons (LabVIEW) or 6 lines of code (C#, VB on .NET) later, the learner has created a voltage meter. To use the drivers require knowledge of the respective programming languages. Using the internet connectivity, the same voltage can now be read across the world using email, browser or messenger. Simple examples are provided to allow the learner to explore and build on the knowledge.